My adventure with adobe began at 634 Garcia Street, Number 8. I like to say I was born there, though I wasn't; it's just the place I came home to after I was born in Marian Hall on Palace Avenue. 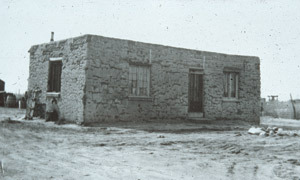 634 was an adobe compound, in the classic Santa Fe sense, owned by Ann Webster. The units sprawled away from the street, accessible by a narrow, dirt driveway. Some of the apartments had been converted from goat pens for human use. Number 8 had poultry, I was told, as the former tenants. Our old black and white family snapshots show a cozy, happy place. It has now been condominiumized, which is not say that it is not still a peaceful place -- it is. I recently did some work there for the new (though long-time) owners who love the place as much as I love my memories of it. Those are my first memories, actually, and still vivid. They conjure what I called, when I learned to speak, "The Blue House"
. Number 8 wasn't blue, of course, only the window and door trim were. My older sister, who disliked everything about me beginning with my existence, thought I was totally stupid to refer to the house as blue. In those days, the late 1940's, Garcia Street was still unpaved and I remember the dust. It is not an unpleasant memory because there weren't clouds of it raised by automobiles, just a bit sifting into the nostrils. Do I really remember a burro loaded with wood coming down the street, or do I just wish that I did? I do recall very clearly being led impatiently down the dirt road by the hand of my sister to Tito's Grocery on the Acequia to bring back the oddment of food or condiment needed at Number 8. It was a quieter, safer time. The second house I lived in was adobe as well, two unplastered rooms (with weeds and cactus growing on the roof) in Agua Fria village. During those few years, my mother drove me to the Garcia Street Club twice a week during the summer. The Acequia Madre ran less than 50 feet from our door in Agua Fria. I once made a boat out of a scrap of lumber at the Garcia Street Club and then asked my mother to stop and let me set it afloat where the ditch emerges on the Arroyo Tenorio side. I then begged her to forgo shopping to take me straight home so I could see the little craft float by. Though the boat never showed, its voyage of whatever length was a kind of mental link between the Blue House and what later came to be called the Old House. In the mid 1950's my parents built an adobe house on West Alameda and it was there that the "poverty" of earth was left behind and the elegance and comfort of adobe were consciously acknowledged. I think of that as a significant transition in my life, though I have to say that I never, not once, experienced poverty and only took my parents' word for our having lived in a class somewhere below middle. Years later, 1962 to be precise, I went to work for the School of American Research. It was headquartered then at Hewitt House, on Lincoln Avenue just behind the Museum of Fine Arts. It was that year, I believe, that Amelia Elizabeth White gave use of one of her outbuildings on Garcia Street to the School as its laboratory. After the summer field season of 1962 I wrote up my notes there, punctuated by breaks wandering in quiet amusement through the dog cemetery where Miss White's Afghan hounds are interred with markers and epitaphs. The place is not called El Delirio for nothing. I worked for the School regularly through 1970 when, after years of evading the draft, I finally graduated college. Three of those seasons were spent on the bottom of the Grand Canyon and on the North Rim excavating earthen architecture in its most rudimentary form. It was then and there, particularly during the off season, when analysis and reflection and writing took place in the lab on Garcia Street, that I really began to develop an interest in earthen buildings and to understand their mechanics and appreciate the simple physics that make them work -- and last. As it happens, then, Garcia Street is my old barrio and a big part of my personal story. The Blue House still appears in dreams now and then, and I still wonder in whose cornfield my little boat went aground. I still have the bread board that I painted for our kitchen as one of my projects at the Garcia Street Club. Volumes containing plans and cross-sections of buildings in the Grand Canyon, drawn by me in the Lab of the School of American Research, sit published on my library shelves. My anecdotes, very personal to be sure, relate some bit parts played in some larger dramas. They are part of a story that centers on Garcia Street and that story, like all good stories, never ends. The Garcia family after which the place was named, still live there (Fred was my seventh grade English teacher), and the School of American Research continues its venerable traditions of scholarship and learning comfortably housed in Miss White's remarkable estate. Astonishingly enough, the Garcia Street Club is still there as well, more than fifty years later. And the Acequia, against all odds, still flows.